Bright10 2017, bad things coming in threes and a power cut! So earlier in the week, yoga had been delayed due to a power cut in the building. I am totally useless about these things, but thankfully some other yogis were able to sort it out and we could proceed by fairy and candle-light. (I may have mentioned this before- at one point we all had to stop because I was in downward dog and then saw a big blob on the floor- I don’t wear my glasses so I got up to take a closer look and realised it was a big spider- not so relaxing!) Anyway, that wasn’t the only power cut that week. 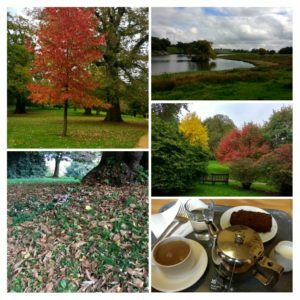 On Saturday after visiting Bushy parkrun (which was very exciting) we headed off to Petworth (a National Trust place of course) for a walk. We’d bought lunch in town earlier so we sat in the gardens and ate it before walking around. The houses don’t tend to interest me that much, but we always walk through to be polite- this one had a big art collection and also a very cool thing- the oldest known globe in the world. I love looking at maps, and this one had expeditions such as Drake’s voyage marked in red across it. I looked at that for quite a while. Of course we had to visit the tearoom, it would be rude not to (and we now have a loyalty card so wanted a stamp for that). We shared some ginger cake, and although it was lovely, it was self service which I am not personally keen on. Later in the afternoon we headed into Chichester for a wander around the shops before heading to the cinema as we had booked to see The Snowman (not the cartoon Christmas one…). I was really looking forward to it because the advert looked great, and although I hadn’t read the book, I had read others by the same author and found them to be page-turners. However the film was disappointing. It wasn’t awful- the film didn’t drag or anything, and it was tense at times, but there were loads of plot holes and weird jumps, so some of it was a bit confusing. It seemed like it strayed too far from the book (this hopefully isn’t a spoiler but apparently in the book the murderer cuts legs and arms off and uses them in place of the sticks for the limbs of a snowman- in the film the murder just build a snowman nearby which was creepy but not really the point of it- but then still had the weird cheese wire thing for cutting the limbs off). If you like a thriller, Wind River (which we saw a few weeks ago) was way better and really worth looking for. I also think a Norwegian film with subtitles would have been better than a load of random English actors (kudos to Borg vs McEnroe who had subtitles for the Swedish bits). When the film finished I had an awful headache (maybe from the tension? )- we headed to GBK on the retail park by the cinema and had a quick dinner before going to our hotel. Thankfully my headache left once I had eaten some food but I made sure to drink a bit more water as I probably hadn’t drank that much during the day. The next morning we had about a 40 minute drive to Brighton- I wasn’t really hungry when I woke up. 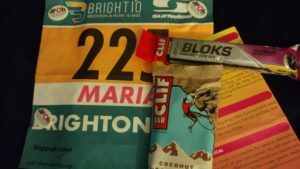 I’d packed a Clif bar (coconut chocolate chip)- I thought it would be white chocolate (due to the colour of the mountain- now I see clearly that it doesn’t say that anywhere) and although I usually prefer dark over white, I wasn’t feeling it, so only ate about half. I thought I would be fine as I usually do my long runs before breakfast, and the race started nice and early (9am) so it wouldn’t be too late after to eat breakfast. I took my shot bloks in my belt just in case. Our journey went fine- we parked in a car park in Hove around 5 minutes walk from the start. I did think that I needed the toilet but Andy convinced me it was all in my brain and I really didn’t want to use either the car park toilets or the port-a-loos, so my decision was made. I’d jut dropped my bag off when it was time to line up -perfect timing! 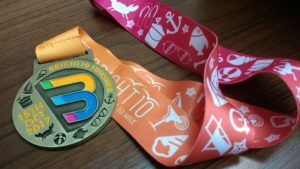 I didn’t have any plans for finish times- I was aiming for under 1.40 (so just under 10 minute miles) but I was wary because last year it was very windy and my leg got sore part way through- sort of twisted- and I really slowed. I knew I wouldn’t get a pb (my 10 mile pb is 1:33.51 which I achieved at the 2015 Bright10), and also it is a bit tricky because the hill is a little later on than it is in the half or full marathon, coming at mile 4 and 5. It was a fairly bright day so I was just out to enjoy myself. I did glance at my watch every now and then to check I was under 10 minutes per mile, but mostly I occupied myself with looking at the other runners (one guy ran in a full on Elmo suit- no idea how he did that). I was so glad I had only worn my vest and not a t-shirt as after only a mile or so I was dripping with sweat- I’d worn a sweatband on my wrist which was much needed! The course was a little different from past years- last year we ran around the Marina a bit but I think work was going on which meant it had to be avoided. 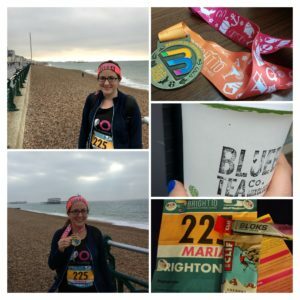 It starts on the Hove lawns (where Hove Prom parkrun starts)- you do a loop of the lawns and run towards Hove for a bit, before joining the seafront and running past the colourful beach huts. 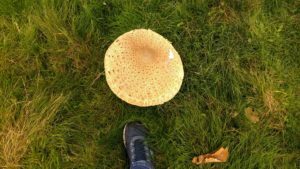 At the 2 mile point you are back by the lawns again and close to the start, before running along the seafront, past the big tower and the pier and then up the hill towards Roedean. This bit is tough as you are going up hill but can see all the faster runners already heading down on the other side of the road. This year the wind was behind as you ran up the hill so it wasn’t as bad as it could be. At the 5 mile point you are at the top of the hill and have to run along a little more before turning around and enjoying the downhill for a mile (albeit into the wind this time). You then run down a path towards the Marina and have a u-turn to run along the seafront (East) and then a sharp u-turn to end up running west along the seafront. The 8 mile marker was close to the pier so I ended up looking in the crowds in case I could see Andy (he’d gone to have breakfast while I was running, and was going to meet me at the finish). I didn’t spot him but apparently he saw me. Mile 9 is around the Hove lawn area, and by that point the crowds were thick with loads of great signs and enthusiastic cheering- Brighton does always have great crowd support. You then have to run a loop (but not as big as the one at the start) to come around to the beach huts again. I was feeling OK but quite thirsty at the end- it was fairly warm and I had noticed the drinks stations but felt OK at the time- really I should have had something at the final one. My final time was 1:35.14, which must be my second fastest 10 miles and only a couple of minutes off my pb. I was pretty pleased with that. My final mile was 8.46 and all the others began with 9 so I was pleased to have run a fairly consistent pace. I was given my medal (which is fantastic as always, and this year had lovely details on the ribbon too). The finish area had water bottles and clif bars so I took water for now, and a clif bar for another day, and then had a little wander after collecting my bag. 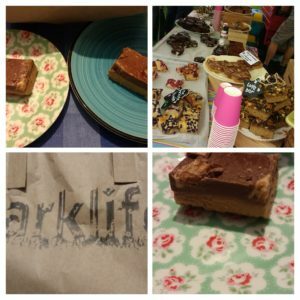 There was an amazing stand called Parklife with the best array of cakes, so I bought a peanut butter square for later (I was going to get a tea but they didn’t have Earl Grey so I thought I’d wait). Andy met me with an almond croissant so I enjoyed my breakfast as we walked into Brighton. I’d packed a towel and change of clothes- usually we stay in Brighton and I can go back to the hotel for a shower, but this year that wasn’t an option so I headed to the swimming pool in the centre- I had to pay £5 but it meant I could use their showers and changing rooms to feel a little more human (although I did wander around the changing rooms for ages because I could not find the showers- I could hear them but could not see them anywhere…). The hairdryers were really like someone gently blowing warm air onto you, which made no difference to my hair, but as it was a fairly warm day this didn’t matter too much (and I’d packed a hat in case it was cold-wet hair makes me so cold). Andy had bought a big cup of tea while I was in there, and then we walked around the shops a bit. 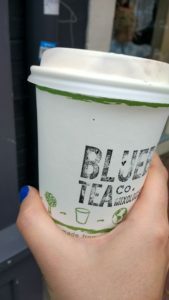 Of course I couldn’t resist going to Bluebird tea (and one of the staff members recognised me as I am such a regular- we hadn’t been to Brighton for months! )- they were doing their own version of a pumpkin spice latte using their teabags, spices and almond milk. I was still super thirsty so had one of those too- it was delicious! We had booked lunch at Food for Friends, my favourite restaurant. I have mentioned it on here before but it’s an amazing veggie and vegan place that just has the best options. Usually when I go out I will look at the two veggie options, but here I can choose from the whole menu and it’s all such tasty and fresh stuff. Anyway, as we arrived they asked us to wait for a bit, and then told us a little later that they had had a power cut, and had to close and send everyone away. I was so sad- I had been looking forward to it so much. Everywhere looked fairly busy so we went to Leon in the end- they do really good hummus so we got some chips and hummus to share, I had a really good haloumi wrap and we shared a lemon ginger crunch bar – all so tasty if not quite what we had planned. We shall have to go back to Brighton sooner rather than later! 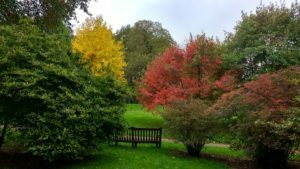 We then walked back to Hove to the car park before driving home- we drove past the park where Brighton and Hove parkrun starts, so I think that might be on my list for the next time we are down. Where is your favourite restaurant? Have you seen (or read) The Snowman? I genuinely feel your sadness about that restaurant having the power cut. I’d have been gutted. I’m seeing my Brighton friend next month (well I’m seeing her tomorrow but going to Brighton to visit properly next month too) so I hope I can persuade her to go again. Well done on the race! Nice work. You’re clearly doing well if you weren’t aiming for a PB but cake close anyway. And the Parklife cakes sound amazing! God that film does not sound my thing. Not the book! Too much gore! I am trying to persuade Andy for us to go next weekend- it’s such a good place to go anyway. Have a fab time- I think parklife is an actual cafe in Brighton so might be worth hunting out?